Learn More About These Outstanding Companies and Individuals! Erik Woods and Cinematic Sound Radio deliver a truly fantastic weekly two to three hour show which covers film, television and video game music in spectacular depth. Erik has been broadcasting Cinematic Sound Radio for over 22 years and he brings all of his radio experience and seemingly endless amount of knowledge of film, television and video game music to the listener every week. Every week, Cinematic Sound Radio features extremely detailed interviews with composers, industry pros, and design engineers as well as great features which dig deeper into film, television and video game music. Cinematic Sound Radio that will not only entertain but inform and educate as well. It's a must-listen if you want to know more about film, television, and video game music! The SoundWorks Collection video series takes you behind the scenes and straight to the dub stage for a look into audio post-production for feature films, video games, and original soundtrack composition. This exclusive and intimate video series focuses on individuals and teams behind-the-scenes, bringing to life some of the world’s most exciting projects. The SoundWorks Collection video series has already surpassed 100 million hits and 7 million views and has included interviews with directors Steven Spielberg, George Lucas, James Cameron, Mel Gibson, Robert Zemeckis, Brad Bird, Mark Andrews, Lee Unkrich, Brian Helgeland, Joseph Kosinski, and many other leaders in the film industry. SoundWorks Collection Website and YouTube Channel ! When visiting Michael's YouTube Channel , please Subscribe and Like his outstanding videos! Scott Glasgow is an award-winning composer who has scored many studio feature films including Lo, The Curse of Sleeping Beauty, Stasis, Poker Night, Hatchet III, Hack!, Chasing Ghosts, The Wedding Pact, Riddle, Toxic, National Lampoon's The Legend of Awesomest Maximus, Bone Dry, Taking Chances (from Lionsgate) and many more. Scott Glasgow has a Bachelor's degree in composition from California State University, Northridge and a masters from The San Francisco Conservatory of Music and teaches film scoring at Universities such as CSUN and UCLA extensions. Scott has studied composition with Conrad Susa and John Corigliano (The Red Violin) as well as working for such esteemed film composers as Bruce Broughton (Silverado), Edward Shearmur (Skeleton Key), Chirstopher Young (Spiderman 3) and many others. Scott was nominated twice in 2011 by the International Film Music Critics Association and the Golden Spirit Award for Best Comedy Score Album for the the feature "Lo". Scott’s last album Riddle was in the first round of Grammy list and had many great reviews including voted the “Breakout Composer of the Year” in 2014 by Examiner.com. Please visit the composer's website at Scott Glasgow Music to learn more about Scott and please subscribe to Scott's YouTube Channel called Cue The Music ! Please like Scott's YouTube videos, too! Since its launch in 2005, WatchMojo has become one of the most successful media brands in Youtube history. An original video pioneer of the long form top ten format, WatchMojo is the choice for entertainment and pop culture news the world over. With over 16.1 million loyal subscribers, WatchMojo has built its business with real, measurable video views. WatchMojo's 15,000+ original videos have generated 8 billion user generated views with a staggering 43 billion minutes of watch time since its launch just over 12 years ago. We use PRONET Licensing and ASCAP for complete rights coverage with the PROs (Professionasl Rights Organizations) to cover all the music we play so we not only bring you the best music but the artists we play can rightfully get paid for their work! fit the web presence that you desire. Shoutca.st is the Intertnet Hosting Company we use to host all the content we play on for Movie Scores and More Radio. They are located in the UK and are just great to be partners with as we broadcast our station to you! Cincinnati Comic Expo , and more. licensed directly thru ASCAP and PRONETLicensing! ​​If you're an Affiliated Artist/Composer, you get royalties from the music we play on Movie Scores and More Radio! Our music data and royalty and performance fees are reported and paid through ASCAP and StreamLicensing, LLC. Movie Scores and More Radio is compiant with all General Data Protection Regulations (GDPR) as we never collect any personal data from our listeners. The services that Movie Scores and More Radio uses to broadcast -- i.e. Apps and Websites -- have their own GDPR compliance protocols. Please inquire with those services for more info about the way they approach being compliant with GDPR. Movie Scores and More Radio is privately owned and operated. ALL TRAILERS, QUOTES, CLIPS AND COMMERCIALS HEARD ON MOVIE SCORES AND MORE RADIO ARE COPYRIGHTED BY THEIR LICENSORS AND ARE SOLELY INTENDED FOR THE PURE ENJOYMENT OF PERSONAL LISTENING ONLY. ANY CONTENT PLAYED ON MOVIE SCORES AND MORE RADIO IS NEVER TO BE SOLD OR TRADED FOR ITEMS OF VALUE. 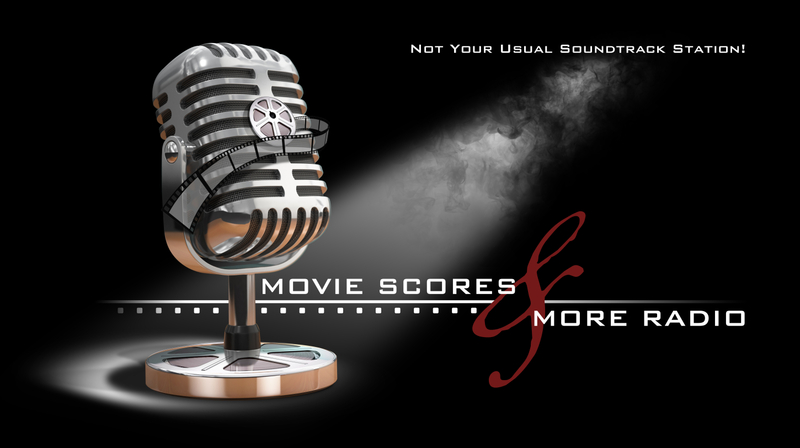 All content on Movie Scores and More Radio is presented by two extremely passionate fans of all-things pop culture in an eclectic, non-programmed mix to enthusiastically celebrate movies, television, video games and all the things that make pop culture so much fun. With all of our value-added content, we not only want to entertain you but also inform and educate as well. MOVIE SCORES AND MORE RADIO IS A PURE AND UNADULTERATED PASSION PROJECT BY JEFFREY AND MARY KERN TO CELEBRATE ALL THINGS POP CULTURE. AS A RESULT WE NEVER ADVERTISE ON OUR STATION. AT ALL. NEVER. EVER. EVER. EVER. Movie Scores and More Radio. If you're new to listening to this type of content, welcome! We hope that what you hear will help you develop a true love for the heart of what makes movies, television and video games so great...the soundtracks, scores, music, and sounds. If you're already a fan of this type of format, we're extremely happy that we can provide this platform to you so you can continue your enthiusiastic love of movies, television, video games and, of course, all the things that make up pop culture as we know it!